← Can I really learn English online? I’ve recently self-published my first book because I wanted to create a resource for anyone here who wants to improve their business English. The idea to write a book came late last year. It’s not something that I’d planned to do, but I had been talking to a teacher in Germany who had recently published a German book. I realised that this was something I might enjoy doing as well. I mainly work with people who want to improve their business English. This means that I know about some of the problems that they have or the tasks that they don’t enjoy doing in English because they don’t feel confident about speaking or writing. The same problems, and as a result the same advice, kept coming up again and again, so I wanted to gather the information together somehow and make it easily available. I decided to split the book up into sections – some of them would be tips on how to get the best results in certain situations and others would look at specific problems that my customers have had, along with suggestions on what people in a similar situation could do. My first job was to make a spreadsheet and decide on my chapters. I wanted it to be a kind of reference book, in which people could go straight to the sections that were relevant to them, but I also wanted some structure to it, so that the individual chapters were grouped into sections. Then came the writing stage, which was actually my favourite part of the process. As long as I had an idea for the heading, I enjoyed researching, discussing the problems and coming up with solutions. I don’t believe that one size fits all, so I think it’s important to offer people a range of ideas, so that they can choose the best one for them. After that came the editing, then the cover design, then the decisions about where to make the book available. I decided to go for a multi-platform approach, rather than to put all of my eggs in one basket. This meant that I couldn’t submit the book to Amazon’s exclusive programme, but I have an international audience and I decided that getting the book in front of more people was more important. Finally I submitted the final draft for publishing. I’m now in the phase of letting people know that it’s out there! If you want to get the book out by a certain date, set yourself a deadline and work backwards from it. Even if you enjoy writing, it’s still important to block out time for it in your day. Have a plan. I changed my chapters around, gave up on some and added others, but I started with a plan about who my audience was, why the book would be helpful for them and how the book would be structured. It’s much easier to write when these things are clear in your head. Find someone to edit, or at least proofread your book. I thought I’d been really thorough, but I had missed things. Sometimes you can be too involved to see the obvious mistakes, and you can’t guess which sentences make perfect sense to you but may confuse others. Be clear about your strengths and weaknesses. If there is something that you really can’t do, find someone else who can do it! I would be hopeless at cover design. Therefore I had the cover designed for me. Be aware that your least favourite tasks might take you longer. Formatting documents is one of my least favourite tasks, so I planned out time for it and gave myself a big mug of hot chocolate as a reward for getting it done! Sometimes the best information is in the forums where other self-published authors hang out! I was lucky because I knew someone who had already published a book, but I also learned a lot by subscribing to podcasts about self-publishing, joining Facebook groups and googling the questions I had about the process so that I could read what others had written on the subject. Hitting publish isn’t the end. There’s no point doing all this hard work if nobody ever finds out about your book. Try to build up some interest around the book before it’s published and try to come up with creative ways of letting people know that it’s out there. This could be posts on your networks, webinars, guest articles on blogs or guest appearances on podcasts. I hope that this has been useful. 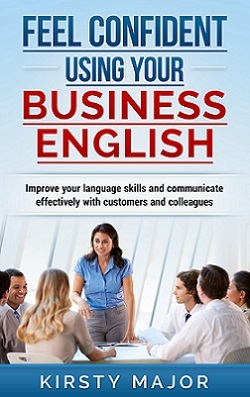 Let me know if you have any questions, and if you want to find out more about “Feel confident using your business English, there’s more information here about what’s in the book and where you can get it. Great post! I’m going to share it with the IATEFL Materials Writing SIG community if you don’t mind? Thank you – I’m happy for you to share it! I don’t have any plans for a second book at the moment, but I’ll keep you in mind!